Stringed Instrument Lacquer, 1 qt. Behlen B611-1406 - Stringed Instrument Lacquer, 1 qt. This item has been replaced by the T31489. Stringed Instrument Lacquer is a high quality nitrocellulose lacquer specifically designed for wooden stringed instruments. Stringed Instrument Lacquer allows for the special expansion and contraction that can occur due to the unique construction of stringed instruments. 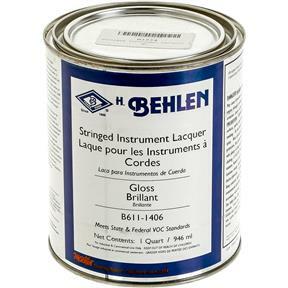 Note: Stringed instrument Lacquer Must be applied over Behlen Vinyl Sealer (H4277) in order to insure its unique film building and special finish characteristics.